This PMR study offers an eight-year analysis and forecast for the global cable cars & ropeways market for the period between 2018 and 2026. The study considers 2017 as the base year with market values estimated for the year 2017 and forecast developed for the duration between 2018 and 2026. The Compound Annual Growth Rate (CAGR) has been calculated from 2018 to 2026. The study covers various perspectives of the market, including market dynamics, value chain, pricing analysis, competition analysis, regional and segmental growth comparison and macro-economic and industry growth analysis, along with segment level projections in a comprehensive manner. As per the findings of the study and perspectives of industry participants, the global cable cars & ropeways market is projected to grow at a CAGR of 8.4% between 2018 and 2026, in terms of value. 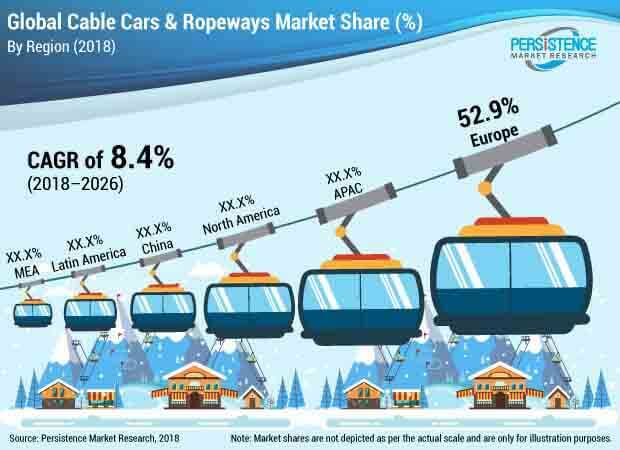 Growing tourism, rising demand from the ski resorts and the urgent need for urban traffic handling are some of the key factors driving the growth of the cable cars & ropeways market globally. The PMR report on cable cars & ropeways market carefully analyses the market at a global and regional level through market segmentation on the basis of key parameters, such as product type and end use. The primary objective of the report is to offer key insights on market updates, competition positioning, current trends, market potential, growth rates and other relevant information and statistics in a suitable manner to the readers or various stakeholders in the market. A ropeway or cable car, often termed as cable propelled transit (CPT), is a transport system in which passenger carrying cabins are propelled by a cable wrapped around a bull wheel at one terminal. Cable cars generally operate overhead and are suspended on single or multiple metal wires. They also operate over a track, wherein the cars are hauled by a metal rope. Cable cars and ropeways are installed for long-term operations in ski resorts and tourism sector and for urban transport and man and material handling applications. The report begins with market introduction, which covers the market taxonomy and product definitions for the global cable cars & ropeways market assessment. In the next section, the report describes the market development background and covers macro-economic factors, industry factors, forecast factors, regional weighted average pricing analysis, value chain overview covering approximate margins, an indicative list of stakeholders involved in each stage and an assessment of the cable cars & ropeways market for the base year considered for the study. The next section of the report discusses market dynamics, such as drivers, restraints and trends, impacting the market growth at a global level. Market opportunities for manufacturers have been presented in the subsequent section of the same chapter. This section also includes the impact assessment of market dynamics on the global cable cars & ropeways market at a qualitative level, based on analysis facts and insights. Subsequent sections of the report provide value (US$ Mn) and volume (Unit Systems) projections for the cable cars & ropeways market on the basis of the aforementioned segments at a global level. The global market values represented in these sections have been agglomerated by collecting data and information at a regional level. The market information, along with key facts and insights, covers unique analysis frameworks, such as absolute $ opportunity analysis, year-on-year growth trend comparison, market share and attractiveness analysis, for each of the sub-types covered in each segment. The next section of the report presents a summarised view of the global cable cars & ropeways market, based on six prominent regions considered in the study. The section includes the regional market position, growth potential, trends, market attractiveness analysis and key insights pertaining to each of these regions. The market analysis sections cover Y-o-Y growth trends, market share analysis, market attractiveness and incremental $ opportunity assessment for each of the aforementioned segments. These sections analyse the degree to which the global drivers are influencing this market in each region. All the above sections evaluate the present market scenario and growth prospects in the global cable cars & ropeways market while the forecast presented in the sections assess the market size in terms of volume and value. In order to offer an accurate forecast, we started by sizing the current market, which forms the basis of how the global cable cars & ropeways market is expected to develop in the future. Given the characteristics of the market, we triangulated the outcome of three different types of analysis, based on primary research, secondary research and our own analysis. However, forecasting the market in terms of various cable cars & ropeways segments and regions is more a matter of quantifying expectations and identifying opportunities rather than rationalising them after the completion of the forecast exercise. In addition, it is imperative to note that in an ever-fluctuating global economy, we not only conduct forecast in terms of CAGR, but also analyse the market on the basis of key parameters, such as Year-on-Year (Y-o-Y) growth, to understand the predictability of the cable cars & ropeways market and identify the right opportunities available. As previously highlighted, the cable cars & ropeways market is split into a number of sub-segments. All the cable cars & ropeways sub-segments, in terms of product type, end use and region, have been analysed on the basis of Basis Point Share (BPS) to understand each individual segment’s relative contribution to the market growth. This detailed level of information is important for the identification of various key trends being witnessed in the cable cars & ropeways market. Another key feature of this report is the analysis of all the key segments in the cable cars & ropeways market, sub-segments and the regional adoption and revenue forecast in terms of absolute dollar opportunity. This is traditionally overlooked while forecasting the market; however, the absolute dollar opportunity is critical in assessing the level of opportunity that a provider can look to achieve as well as to identify potential resources from a sales and delivery perspective in the cable cars & ropeways market. In order to understand the key market segments in terms of the growth and consumption of cable cars & ropeways across concerned regions, PMR has developed the attractiveness index, which will help providers to identify real market opportunities. In the final section of the report, a competitive landscape of the cable cars & ropeways market has been included to provide report audiences with a dashboard view, categorised on the basis of providers present in the value chain, their presence in the cable cars & ropeways market and key differentiating factors and strategies. The primary category of providers covered in the report is cable cars & ropeways manufacturers. This section is primarily designed to provide clients with an objective and detailed comparative assessment of the key providers specific to a market segment in the value chain of the cable cars & ropeways market. Report audiences can gain segment-specific vendor insights to identify and evaluate key competitors on the basis of in-depth assessment of their capabilities and success in the cable cars & ropeways marketplace. Detailed profiles of providers have also been included under the scope of the report to evaluate their long- and short-term strategies, key offerings and recent developments pertaining to the cable cars & ropeways market. Examples of some of the key competitors covered in this report include Doppelmayr/Garaventa Group, Leitner Group, Leitner-Poma of America, Inc, MND Group, Bartholet Maschinenbau AG (BMF), Nippon Cable Co., Ltd., CONVEYOR & ROPEWAY SERVICES PVT. LTD., Damodar Ropeways & Infra Ltd., STM TELEFERIK and CCM FINOTELLO SRL, among others. Installations of new gondola lifts are estimated to be valued at over US$ 1,600 Mn by 2018 end. With an anticipated annual growth rate of 8.4%, the cable cars & ropeways market is estimated to reach a value of more than US$ 3,000 Mn by 2026 end. The rising demand for gondola lifts in the tourism sector as well as urban transportation is expected to be a prominent factor driving the growth of the segment. In terms of overall spending, gondola lifts are expected to create a relatively high incremental $ opportunity in cable cars & ropeways market, valued at more than US$ 1,400 Mn. It is anticipated to be a money-spinning segment in the global cable cars & ropeways market. Gondola lifts are expected to emerge as a competent solution for urban transportation problems, owing to advantages such as enhanced passenger transportation capacities and high-speed operation. Moreover, gondola lifts with glass cabins are being widely installed at tourism destinations to attract tourists. The use of glass cabins also acts as a value addition in the cable cars & ropeways system. Attributing to the popularity of gondola lifts in the cable cars & ropeways market, several players are venturing into the manufacturing of customized products. Some of the prominent players in the cable cars & ropeways market are investing in developing efficient cable cars & ropeways technologies using renewable sources of energy with increased capacities. Market players are also noted to focus on building all possible amenities inside the cabins, including amenities such as HVAC vents and infotainment alternatives, among others. Customer preferences are shifting from bicable gondolas to monocable or tricable gondolas in the cable cars & ropeways market. One of the significant causes affecting this shift is the complex design of bicable systems and the high cost associated with them. Monocable and tricable technologies are relatively easier to install and cost effective and are expected to fuel growth in cable cars & ropeways market. The growing public spending on leisure activities is creating a need for modernized modes of transport in amusement parks and other recreational activities. The steady rise in the urban population has resulted in a lack of available land. Moreover, nearly 70% of the urban population requires efficient mass transit facilities for daily commute. Also, cable cars & ropeways are gaining prominence among the governing authorities to improve urban mass transit systems. Being eco-friendly and encouraging the use of renewable sources of energy, cable cars & ropeways are estimated to gain eminence over the forecast period. Several government and regional transport authorities are focusing on the adoption of fast and energy-efficient modes of transport and cable cars & ropeways are gaining attention. Subways and metros have been complimenting urban transportation for decades; however, the cost of the civil structure associated with metros is high and is not feasible at every place. Cable cars & ropeways, especially gondola lifts, are noted to offer comparatively lower operating costs. The overall cost associated with cable cars & ropeways projects is estimated to be 1/3rd to 2/3rd of the overall cost associated with other transportation systems. All these factors are propelling the growth of cable cars & ropeways market. With a rise in the GDP and increasing disposable income, consumer lifestyles have also changed. Consumers are now capable of spending a significant share of their earnings on amusement and leisure activities. This positively impacts the adoption of cable cars & ropeways in amusement parks. Some large-scale hotels and malls are also observed to install cable cars & ropeways system in order to attract customers. These factors are prominently driving the growth of the overall cable cars & ropeways market. As per PMR analysis, the top two global players collectively account for over 60% of the overall cable cars & ropeways market share. Along with offering customized services, cable cars & ropeways manufacturers also offer a wide range of spare parts and aftermarket services to their clients. Such strategies enhance the brand reputation and also augment customer loyalty towards the company’s cable cars & ropeways products. Several other players are noted to operate on a regional level and assist the growth of the overall cable cars & ropeways market. In North America cable cars & ropeways market, the gondola lifts segment is anticipated to gain more than 1,000 BPS between 2018 and 2026. The segment is forecast to witness rapid short-term expansion, due to the high adoption rate of cable cars & ropeways in mass urban transportation. In Latin America cable cars & ropeways market, countries such as Colombia, Bolivia and Venezuela, are projected to register rapid growth in the near future, owing to growth in urban public transport networks. In countries such as Peru and Chile, a number of cable cars & ropeways projects are now in the planning or development stage. Throughout the forecast period, gondola lifts is expected to remain dominant in the APAC cable cars & ropeways market. Among other cable cars & ropeways product types, it is anticipated to grow at a rapid pace in the near future, owing to the speedy adoption rates mainly in countries like India and South Korea. APAC cable cars & ropeways market is estimated to grow at a healthy rate. The Europe cable cars & ropeways market is expected to record fastest growth, owing to its adoption in mass urban transportation applications across countries such as Austria, Italy, France, Poland and Russia. Damodar Ropeways & Infra Ltd.